We're experiencing yummy new beers this season...beers in the bottle that is. 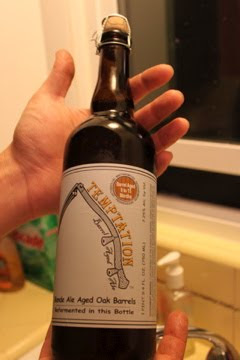 Take this here Temptation for example, a fermented blonde ale brought to you by the folks who bottle such favorites as Pliny the Elder and Blind Pig. This beer is fermented with a special strain of yeast and aged in French oak chardonnay barrels for twelve months, resulting in a decidedly spirited, grapey flavor. We like. We like a lot. While the aesthetic of a tap will always be dear to our hearts, we've been happily indulging in what certain sealed glass has to offer. Bless you, Russian River, you continue to win our hearts overandover again. next time you're down my way, the pints are on me!